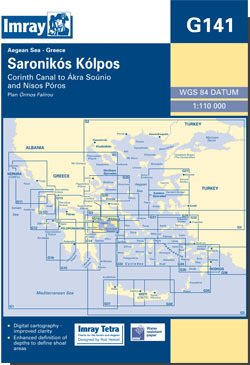 Imray chart G141 Saronikós Kólpos. Inclusief kanaal door Korinthe, Akra Sounio en Nisos Póros en detailkaart voor Ormos Falirou. Imray G141 Saronikos Kólpos. Inclusief kanaal door Korinthe, Akra Sounio en Nisos Póros en detailkaart voor Ormos Falirou. The Saronic Gulf from the Corinth Canal to Poros . Scale: 1 : 109.000. For this 2014 edition the chart has been fully updated and modernised throughout. Harbour developments are shown at Órmos Falírou, and new plans of Marina Alimos (Kalamáki) and Limín Aígina have been added.